Domestic Cleaning"I've used domestic cleaning services a couple of times but never had experienced such ideal cleanness. I'm definitely going to use your help on a regular basis from now on." To ensure the perfectly clean and spotless state of your garden paths, patios, driveways and outdoor areas you can use our affordable patio cleaning services. 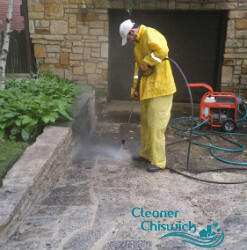 Our jet washing machines which work under high pressure ensure effective and thorough sanitising of paved, brick, concrete, limestone and natural stone surfaces. Get in touch with us to book the patio cleaning which you need that we provide in Chiswick W4 and your property will look great. The weeds, mud, stains, moss, algae and chemical residues will be completely removed from your patios. Fill the form for a free quote! If the walls, paths, concrete, brick or natural stone areas, walls and surfaces of your outdoor areas aren’t maintained properly, use our patio cleaning services. Our technicians will pressure wash them using powerful and advanced jet washing machines. Using water, electricity and mild cleaning solution whenever it is necessary, our staff can remove every stain, deposits of algae, moss, weeds and grime. The patios in your property will become impeccable and look much better after we pressure wash them. The only way to make the outdoor areas in your property cleaned thoroughly and safe from accidents is by using the services of a reliable pressure washing provider. We offer excellent patio cleaning in W4 Chiswick which ensures perfectly sanitised external walls, pavements and walkways. The garden paths, driveways and the outdoor walls of your property will be cleaned thoroughly and won’t have any weeds, moss or algae. 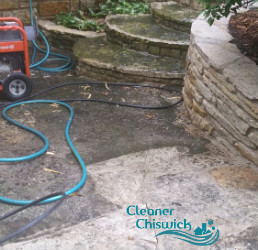 Use our affordable and trustworthy patio cleaning services that we provide in W4 Chiswick any time when you need them. You will have perfectly maintained garden, patio and outdoor areas which will make your home and property look presentable and attractive. Schedule an appointment with our technicians to inspect your garden and outdoor areas and get a quote. Copyright © 2015 - Cleaners Chiswick.